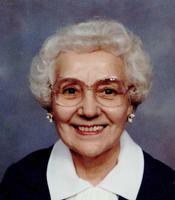 ROZALIA B. McINTYRE (nee Boszlay) age 98. Passed away peacefully at her home January 10th. Beloved wife of the late Donald; loving mother of Gloria; sister of the late Elizabeth and Ernest Boszlay. Special thanks for the loving care provided by Dolores, Peggy, Nora and Linda. Friends received SUNDAY 2-4 AND 6-8PM at Church of the Redeemer 23500 Center Ridge Rd. Westlake, OH 44145. FUNERAL SERVICE 11AM MONDAY at West Side Hungarian Reformed Church 15300 Puritas Ave. Cleveland. Interment Sunset Memorial Park. Contributions may be made to Parish Nurse Fund c/o Church of the Redeemer.